To make money in backgammon, you need two elements: a skill advantage, and good money management principles, which mainly means correctly establishing your bet and handling the cube properly. Chabot introduces an additional goal: that of maximizing the rate of increase of your wealth. 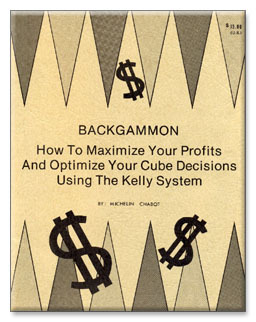 John L. Kelly Jr. established a theory known as the Kelly theory which permits us to derive our optimal bet and to optimize our cube decisions. COVER: (1) How to establish your optimal bet. (2) Why the standard 3 to 1 rule is now a thing of the past. (3) How to benefit from the ten-commandments of money management. (4) The secret behind the "Incredible Chabot Paradoxical Proposition." (5) How to make more money faster than you ever did before.